James B. Weaver helped found the People's Party in 1891, a group commonly known as the "Populists." Weaver was a politician and a large part of the Greenback movement. 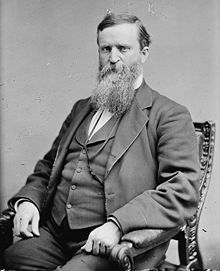 He successfully ran for Congress in 1884 and was re-elected in 1886, serving from 1885 to 1889. He ran for president with the Populist party in 1892. Weaver believed in the ideas of a national currency backed by a commodity, such as silver or gold, as well as an eight hour work day.